Queries: please email serkits1@aol.com or write with SAE to the address below. Kits and parts are only available direct from Dan Garrett, 20 Weald Close, Weald, Sevenoaks, Kent, TN14 6QH (Mail order only). Cheques made out to D. Garrett with order, sorry no plastic. 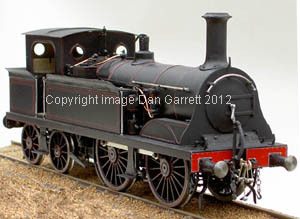 Locomotive kits and etches – £60 non-returnable deposit, balance payable when I let you know the kit or etch is ready. Please add post & packing as shown in catalogue, but I reserve the right to increase prices as postage continues to go up (far more than the cost of living). Overseas insured postage at cost + £2.50. Customers are welcome to pick up an order by prior arrangement. New orders are generally dealt with in 3-10 working days. Please note that my ‘real’ work sometimes takes me away from home, and then orders may take a month or more. As far as possible, I will advise on delivery times if you email me first or include an SAE. Cheques will not be cashed until order despatched. I can’t afford to hold a stock of locomotive etches, and they are ordered as needed. This usually takes about 2-3 weeks from receipt of your deposit. As and when time permits, kit specifications are improved. Wagon and Carriage kits all have high quality resin castings. Self-contained buffers are now supplied assembled. When available, brake levers will be etched rather than cast.